If you’ve never considered getting a water fountain for cats, it’s time to consider the benefits. Basically, your pet will have clean water, 24/7, and you don’t have to do anything but some routine maintenance. Pretty awesome, right? That’s why we researched some of the best fountains around to help you find the right one for you and your pets. Before we get started, let’s look at some key features you should consider before you start shopping. Capacity: These fountains hold anywhere from 60 to 168 ounces of water. That’s a big difference! If you have more than one cat or if you don’t want to have to refill your fountain too often, go for a larger capacity. Size: You should consider the size of your space before choosing a cat fountain. Their sizes vary a bit. The good news? We found great options that will fit into your home no matter how much space you have available. 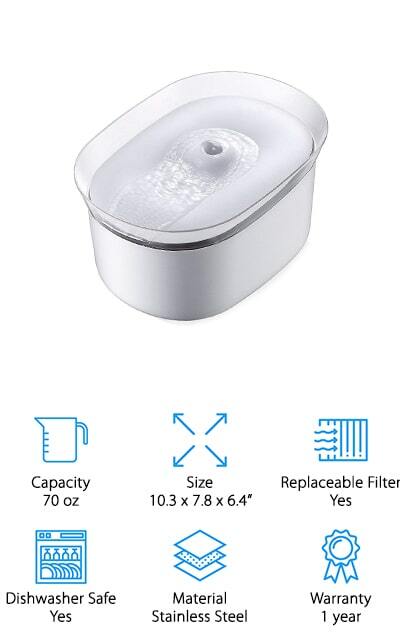 Replaceable Filter: All of these products come with replaceable filters which is really important. Using a good filter is the only way to keep harmful contaminants out of your pets’ water. Plus, it makes it taste fresh and keeps away odors. Dishwasher Safe: Another great thing about our picks is they’re all dishwasher safe as long as you remove the pump and other electrical components. Just place them in the top rack of the dishwasher and you’re ready to go. Material: Our top picks are made of either of BPA free plastic or stainless steel. We also found one really cool option that’s made of ceramic. All of these materials are safe, easy to clean, and pretty durable. Warranty: The products we reviewed come with a variety of warranty lengths from 1-3 years. A couple did not list a warranty. Check this information to know if the product you choose is covered. Now that you know the key things to look for, let’s get into our best cat water fountain reviews. Here’s how it works. We put our top and budget picks right at the top of the list. If you’re in a hurry, this is the best place to start so you get a good idea of the range that’s available. If you have time, stick around! You never know which one will be the right one for you. Okay, let’s get started. The best running water fountain for cats we came across in our research is the PetSafe Drinkwell Water Fountain. It has the largest water capacity of all the products on our list which makes it great for homes with multiple pets. That’s not all, you won’t have to refill it as often, either. Even though it holds such a large amount of water, it’s still a nice size that won’t take up too much floor space or get in the way. The carbon water filter removes any impurities so your cat will have constant access to water that tastes great and has no odor. This fountain is made of BPA-Free plastic and everything but the pump can be placed in the top shelf of the dishwasher. If you’re looking for a cheap cat water fountain, you are looking for something that’s both budget-friendly but also a great product. To that end, we introduce our budget pick, this adorable fountain from Catit. 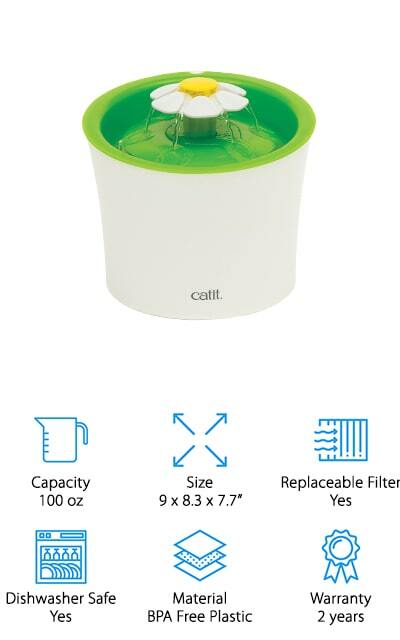 One of the best things about it is the 3 different water flow settings that cater to picky drinkers while keeping the water circulating to stay fresh. This fountain is a compact size and great for small spaces. It comes with a water-softening filter that not only removes chlorine, odors, and bacteria, but also magnesium and calcium which can help prevent some health problems for your kitty. The filter should be replaced every month for optimal efficiency. One more thing, this fountain has a super cute design where the water flows out of a large daisy shape. Next up is this ceramic cat water fountain from iPettie. The Tritone Drinking Fountain is made of high-quality ceramic that’s both environmentally friendly and non-toxic. The great thing about ceramic is it won’t discolor over time like plastic can and lasts practically forever. The dual filtration system is comprised of foam rubber to mechanically separate and pet hair or debris from entering the pump. The carbon and charcoal filter out any bad tastes, chemicals, and odors so your pet has the freshest drinking water possible. That’s not all, the 71-ounce capacity is large enough to keep one cat hydrated for at least 2 weeks, perfect for weekends away or long holidays out of town. Plus, everything except the plug and pump can go right in the dishwasher for fast, thorough cleaning. 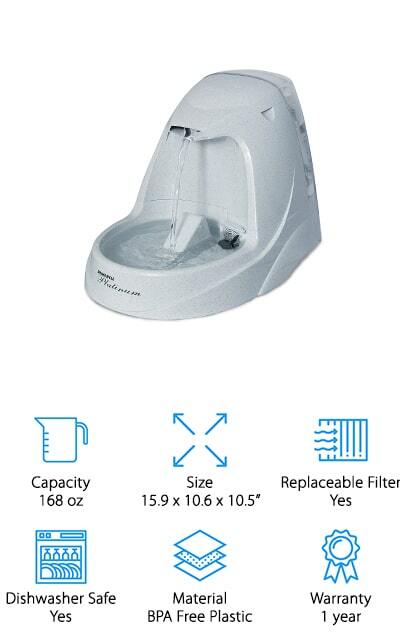 One of the best things about this cat waterfall drinking fountain from PetSafe is that it’s multi-tiered. That means it’s perfect for pets of all sizes. Larger cats or even dogs can drink from the top tier which allows smaller animals to drink from the bottom without having to fight for space. It’s also a great choice for older cats that might have a hard time stretching to read the higher bowl. The free-falling stream helps to circulate more oxygen to keep the water fresh and encourage your pets to drink it. There’s even a receiving ramp for the water to gently run down so it doesn’t splash or make too much noise. 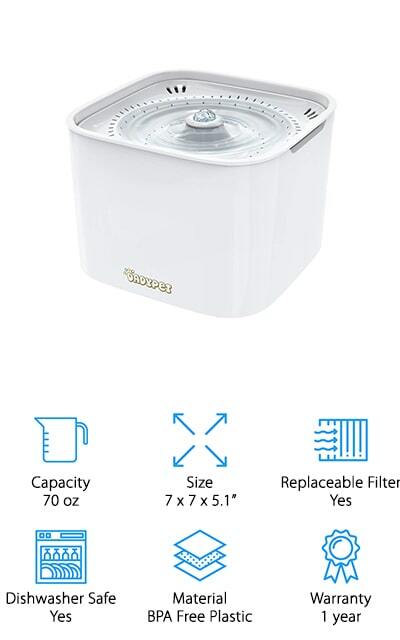 Every part of this BPA free plastic water fountain is top-shelf dishwasher safe, except for the pump. 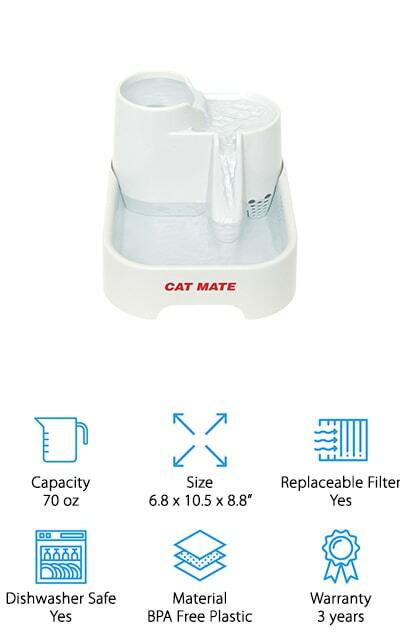 This product from Cat Mate is another good choice for a multi-level cat waterfall fountain that caters to both small kittens, large cats, and small dog breeds. One of the things your pets will like about this is you can adjust the pump so water moves faster or slower. There’s a ramp that catches the water to prevent water splashing and the pump system is isolated so this pump runs as quietly as possible. It features a polymer-carbon filter to purify the water so it looks, smells, and tastes delicious to encourage your cat to drink. Change the filter once a month to make sure it’s performing as efficiently as possible. Everything except the pump is dishwasher safe so it’s really easy to keep clean, too. 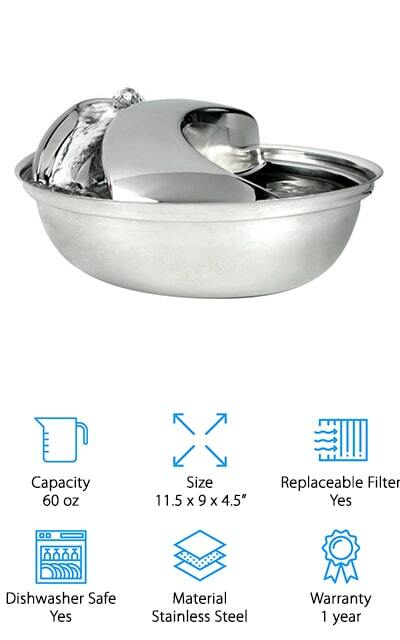 The Pioneer Pet Drinking Fountain is a great stainless steel cat water fountain that looks like it belongs in your kitchen. The stainless steel finish looks more sophisticated than plastic and blends in well with the rest of the gadgets and appliances in your kitchen. It has a really modern look that you won’t mind having on display all the time. The charcoal filter removes any impurities so the water looks and tastes great, enticing your pet to drink. It eliminates any odors, too. This fountain is easy to take apart and clean and everything but the pump is dishwasher safe. And get this, the cord is 7.3 feet long which gives you a little more freedom because you don’t have to be too close to an outlet. A great choice, if you’re looking for a quiet cat water fountain, is this one from Uniclife. Rather than a waterfall design, this fountain has a free-falling stream of water. It sort of resembles the arch of a water fountain that you’d drink from. You can increase or decrease the flow, too. This is a great feature to have with a fountain like this because the free-falling water could be a little too much for some smaller cats and kittens. 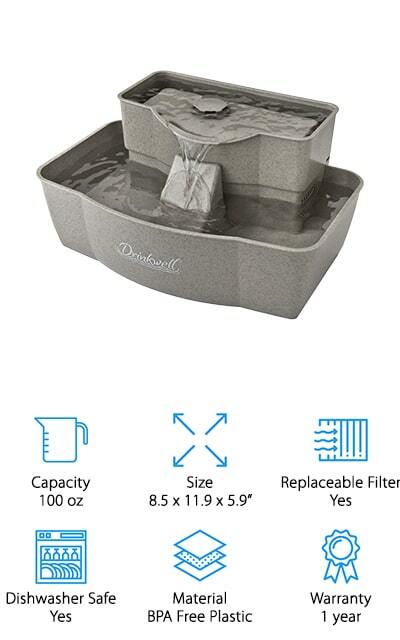 And get this: it’s equipped with an LED light in the water area so that your pets can always find their fountain, even at night. Plus, the water is filtered using both foam for large debris and carbon to remove any chemicals or bad tastes. The Moer Sky Pet Fountain is a great choice for a super quiet cat water fountain and it’s super cute, too. For one thing, there are 3 different water flow settings. The flower waterfall uses the cute plastic flower in the center of the top basin as water gently flows between the petals. In flower bubble mode, the water creates a stream-like surface with a little more pooling. Lastly, the gentle fountain setting provides even more polling for pets who are really thirsty. There’s more, this fountain is also designed to maximize the surface area between the water and air to help keep the water fresh. It also includes activated carbon filters to get out any impurities as well as a coordinating silicone mat to protect your floor from splashes and spills. 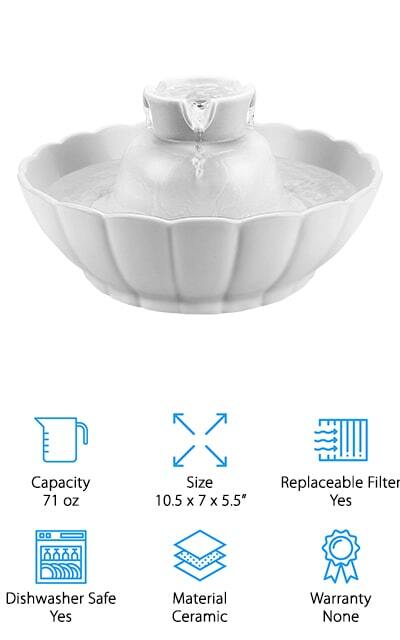 Our next pick for best circulating water fountain for cats is this simple, stylish option from HoneyGuaridan. This is a great choice for anyone who doesn’t have a lot of room. First of all, it has a small footprint that doesn’t take up a lot of room. Plus, the elegant design would look great in your kitchen. In fact, it actually matched nicely with stainless steel appliances and blends in quite nicely. That’s not all, it’s also BPA free and FDA approved. This fountain comes apart easily for cleaning and everything but the pump is dishwasher safe. 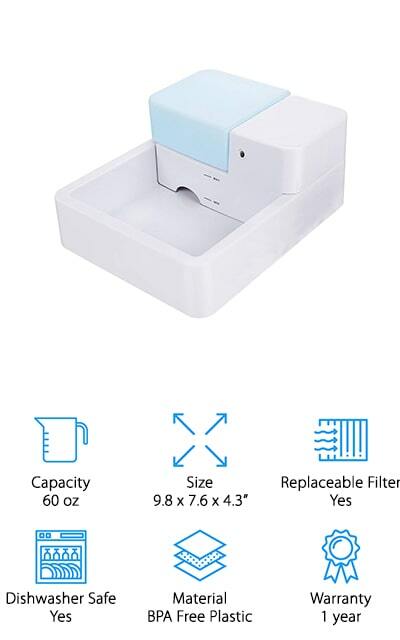 It also includes a carbon filtering system that removes the chemicals and bacteria that cause bad taste and odors, keeping the water fresh and your cat happy and hydrated. Last but not least is the DADYPET Cat Water Fountain. There are a few different flow settings for this fountain which will satisfy even the pickiest of cats. 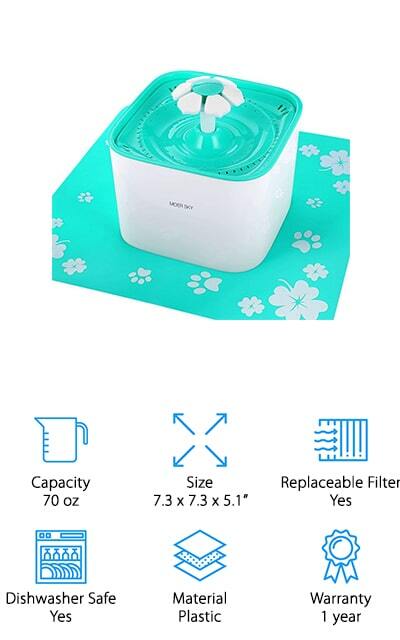 Flower waterfall, flower bubble, and gentle fountain each provide different drinking experiences so, whether your pet likes a strong flow or a slow one, you’ll be able to make them happy. This fountain has a really small footprint that makes it perfect for small spaces. The material is highly polished resin that’s BPA free, non-toxic, and odorless. It even has food-grade certification so you can trust it’s safe and healthy for your cats. The pump is really quiet and won’t distract or disturb you or your pet. Plus, the whole things comes apart quickly for easy cleaning.